So there’s no hard and fast rule that the two should line up. 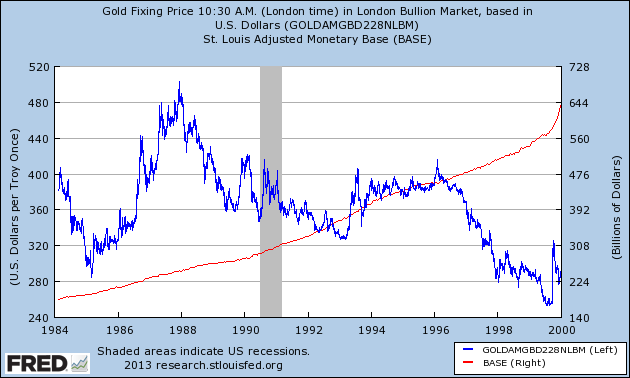 My belief is that the gold price has been driven by a lot of moderately interconnected factors related to distrust of government, central banks and the financial system — fear of inflation, fear of counterparty risk, fear of financial crashes and panics, fear of banker greed and regulatory incompetence, fear of fiat currency and central banking, belief that only gold (and silver) can be real money and that fiat currencies are destined to fail. The growth in the monetary base is intimately interconnected to some of these — the idea that the Fed is debasing the currency, and that high or hyperinflation or the failure of the global financial system are just around the corner. These are historically-founded fears — after all, financial systems and fiat currencies have failed in the past. Hyperinflation has been a real phenomenon in the past on multiple occasions. But in this case, five years after 2008 these fears haven’t materialised. The high inflation that was expected hasn’t materialised (at least by the most accurate measure). And in my view this has sharpened the teeth of the anti-gold speculators, who have made increasingly large short sales, as well as the fears of some gold buyers who bought a hedge against something that hasn’t materialised. The global financial system still possesses a great deal of systemic corruption, banker greed and regulatory incompetence, and the potential for future financial crashes and blowups, so many gold bulls will remain undeterred. But with inflation low, and the trend arguably toward deflation (especially considering the shrinkage in M4 — all of that money the Fed printed is just a substitute for shrinkage in the money supply from the deflation of shadow finance!) gold is facing some strong headwinds. 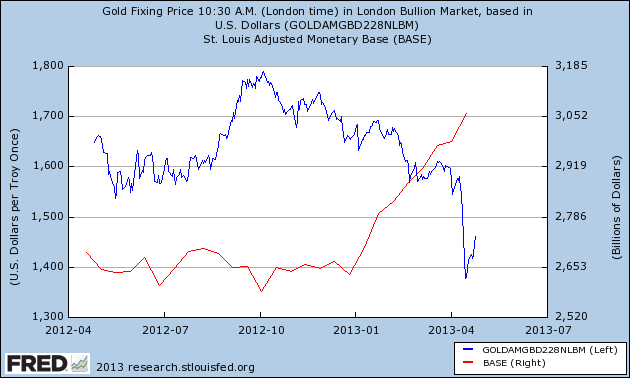 And so a breakdown in the relationship between the monetary base has already occurred. Can it last? Well, that depends very much on individual and market psychology. If inflation stays low and inflation expectations stay low, then it is hard to see the market becoming significantly more bullish in the short or medium term, even in the context of high demand from China and India and BRIC central banks. 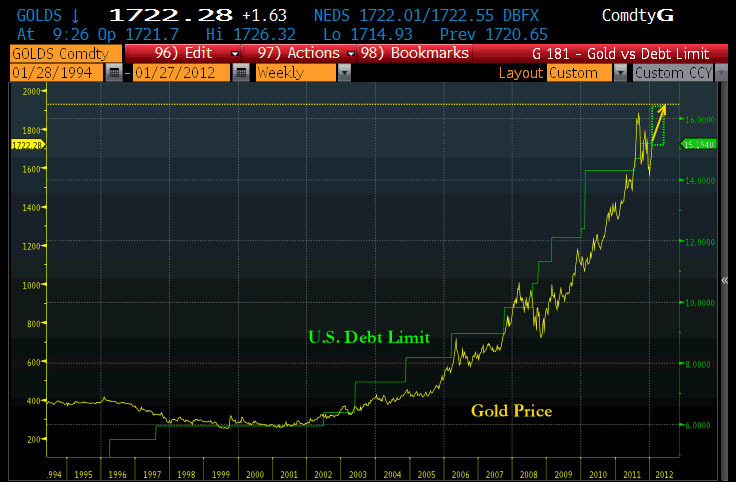 The last time gold had a downturn like this, the market was depressed for twenty years. Of course, those years were marked by large-scale growth and great technological innovation. If new technologies — particularly in energy, for example if solar energy becomes cheaper than coal — enable a new period of spectacular growth like that which occurred during the last gold bear market, then gold is poised to fall dramatically relative to output. But even if technology and innovation does not produce new organic growth, gold may not be poised for a return to gains. A new financial crisis would in the short term prove bearish for gold as funds and banks liquidate saleable assets like gold. Only high inflation and very negative real interest rates may prove capable of generating a significant upturn in gold. Some may say that individual, institutional and governmental debt loads are now so high that they can only be inflated away, but the possibility of restructuring also exists even in the absence of organic growth. 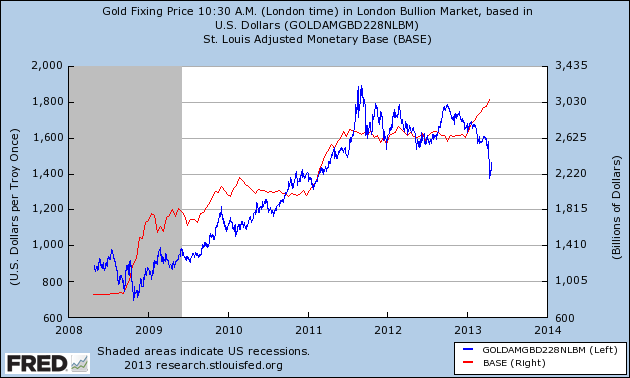 A combination of strong organic growth and restructuring would likely prove deadly to gold.